Health and Human Services Secretary Kathleen Sebelius' invitation to speak at Georgetown has drawn the ire of a Catholic group. Washington (CNN) – The Archdiocese of Washington, the Catholic Church’s authority in the nation’s capital, is rebuking another Catholic icon, Georgetown University, the oldest Catholic college in the United States. 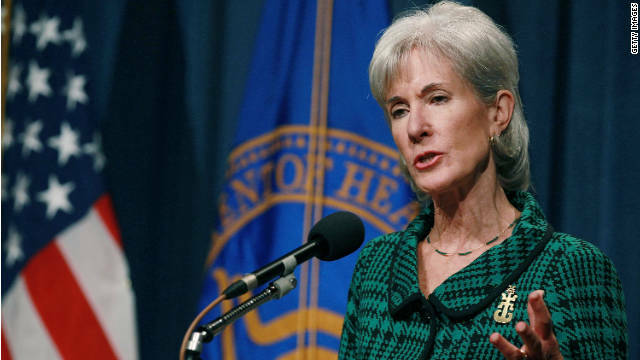 The conflict is over the university’s Public Policy Institute’s invitation to Kathleen Sebelius, the U.S. Secretary of Health and Human Services, to be its 2012 award ceremony speaker this weekend. The decision drew immediate ire from Catholic groups who see Sebelius, a Catholic, as someone who is using her office to violate religious liberty. Catholics groups have taken particular issue with the HHS mandate that religious employers offer health insurance coverage that includes access to contraceptives and birth control services. The Catholic Church teaches that use of contraception and abortion are morally wrong. Seven states, along with a handful of religious organizations, have filed a lawsuit against the federal government over the issue. Georgetown University President John J. DeGioia had issued a statement attempting to create some distance between the university and the contraception issue. However, DeGioia did support her invitation to campus. The archdiocese shot back. “Contrary to what is indicated in the Georgetown University President’s statement, the fundamental issue with the HHS mandate is not about contraception. As the United States Bishops have repeatedly pointed out, the issue is religious freedom,” its statement said. After the uproar over the Sebelius selection first unfolded, HHS spokesman Keith Maley highlighted the former Kansas governor’s credentials as the reason she was selected. "As a state legislator, insurance commissioner, governor and now cabinet secretary, Secretary Sebelius’ message will be about honoring the achievements of these students who are devoting their careers to public policy," said HHS spokesman Keith Maley. Georgetown’s Washington, D.C. location has made it the location of a number of high-profile political speeches in the last year. Many of these have led to protests from both conservative and liberal wings of the politically diverse Catholic Church. Just last month, a budget speech by Rep. Paul Ryan (R-Wisc. ), a Catholic, led vocal criticism from 90 members of the Georgetown staff. The group sent a letter that questioned the budgets Catholic principles and its emphasis on cutting social safety net program. “We would be remiss in our duty to you and our students if we did not challenge your continuing misuse of Catholic teaching to defend a budget plan that decimates food programs for struggling families, radically weakens protections for the elderly and sick, and gives more tax breaks to the wealthiest few,” read the letter. This is not the first time that a Catholic university’s decision to invite an Obama White House representative to speak has elicited a negative reaction from Catholic groups. In 2009, after President Obama was selected to speak at the University of Notre Dame commencement, Catholic organizations protested the selection. During the speech, Obama addressed the abortion issue. "Each side will continue to make its case to the public with passion and conviction," the president told the Fighting Irish graduates. "But surely we can do so without reducing those with differing views to caricature." - CNN’s Sally Holland contributed to this report. Each day the hierarchy of the Catholic church is more and more out of touch with its people. That is your opinion and the way you render it indicates it is the Church who has lost touch. What if it is the people who have lost sight of the truth the Church offers? Try to keep an open mind. Just because you find the teaching inconvenient doesn't mean it is invalid. Nope your just one more liar. Prayer doesn’t not; you are such a LIAR. You have NO proof it changes anything! A great example of prayer proven not to work is the Christians in jail because prayer didn't work and their children died. For example: Susan Grady, who relied on prayer to heal her son. Nine-year-old Aaron Grady died and Susan Grady was arrested. Nope your just a proven liar. Prayer doesn’t not; you are such a LIAR. You have NO proof it changes anything! A great example of prayer proven not to work is the Christians in jail because prayer didn't work and their children died. For example: Susan Grady, who relied on prayer to heal her son. Nine-year-old Aaron Grady died and Susan Grady was arrested. Reply is not relevant to message given. What is up ? Planned Parenthood can offer deep discounts for those who say they cannot afford said protection. The door is open for other ideas!!! Cheers to G-town and the Jesuits! Good people all around.